Nothing screams fall to me like a St. Louis Merb’s Bionic Caramel Apple. Ever since I was a little girl I couldn’t wait for October to arrive. I’d march over to the grocery store and pick up a Merb’s Caramel Apple, covered in a thick, rich, creamy, gooey, caramel, and coated with fresh roasted pecans. It’s heaven on a stick! 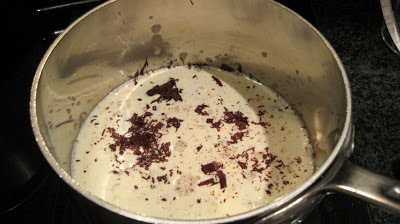 Bring cream just to a boil in a 1- to 1 1/2-quart heavy saucepan over moderately high heat, reduce heat to low and add chocolate. Let stand 1 minute, stir until chocolate is completely melted. Boil mixture uncovered, without stirring, but gently swirling pan occasionally, until sugar is deep golden, about 10 minutes. Note: Do not rush this step. It may feel like it takes a long time for the caramel to reach this temperature, but if you rush it by turning up the heat, you will burn the caramel, and waste all your ingredients. Be patient, and you’ll be thrilled with the results. Add butter, stirring until completely melted. 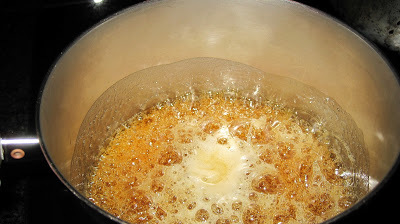 Pour into a heatproof bowl (do not scrape any caramel clinging to bottom or side of saucepan), and set caramel aside to cool for approximately 5 minutes. While caramel is cooling, insert candy apple sticks into (center) stem end of apple. Holding an apple by the stick, dip and roll it in the chocolate caramel until evenly coated, letting any excess drip back into the bowl. (If caramel runs off quickly and the coating seems thin, it’s too hot. Let cool a minute longer and try dipping again). If desired dip coated apples in chopped pecans, toffee chips, or drizzle with melted white chocolate. Can be refrigerated for several days. To give as a gift place in plastic gift bag, and tie a ribbon around the stick to keep bag closed until gift-giving! I’ve never had a Merb’s Bionic Carmel Apple. I lead such a sheltered life! And I haven’t made caramel apples since – well, since I was a kid! Maybe I should again? Your recipe looks so tremendous – this is one I should try. Thank you. You’ve probably never had one because you don’t have a sweet tooth like I do. Well you should try one if you like caramel apples, they’re wonderful. I will be posting another recipe with a regular caramel apple soon. I have to finish these up first. I hope you try these, they’re yummy. Beautiful chocolate caramel apple! I still remember when I first saw this chocolate covered apple for the first time at a supermarket in the US. I wondered how we eat it without making a mess. 🙂 I have never made it before but it looks fun to do with the kids. Thank you for the recipe Vicki! I eat mine with a knife. I don’t bite into it. I cut off wedges and eat it that way. Then if I don’t finish it I wrap it up and someone else in my family can take a slice as well. They’re so good! My favorite this time of year. I hope you try these with your children. Oh thank you. They’re definitely tasty, especially if you’re a chocolate caramel fan. Luscious and delicious! I need one now! You should make some for you and to give away. They’re wonderful! I know. Thank you for your compliment! It just wouldn’t be a caramel apple to me without the chocolate 😉 I haven’t made them for such a long time but what a delicious treat they are! 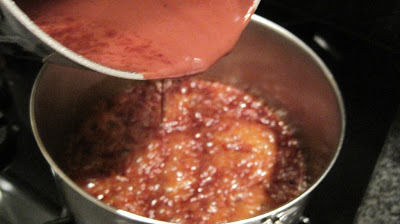 I much prefer making homemade caramel compared to store bought. I love that your recipe combines the caramel and the chocolate together! Thank you. I still love the plain caramel apples but adding the chocolate takes them to the next level. I hope you try them. I always see those for Christmas time at our christmas market in austria, I even remember trying one when I was a kid. Thanks for this lovely post and the recipe. I hope I ll find some time to recreate it for christmas time, I bet my husband will enjoy it as well as I do. They make a nice treat. They’re nice to eat yourself, give to the neighbor kids for Halloween or as a gift wrapped nicely for the holidays. Who doesn’t like a caramel apples plain or chocolate covered! I hope you try them. 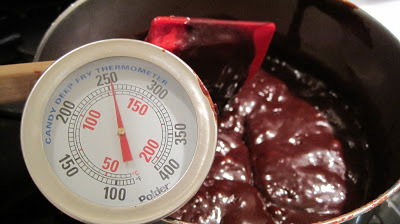 Just be sure to have a good candy thermometer. Very yummy indeed, who needs dessert with these wonderful apples! I’d much rather have one of these than most any sweet confection! Wow! How much fun is this recipe -I’ve never made or even tasted a gourmet chocolate caramel apple but now you’ve got my attention! Oh, my. 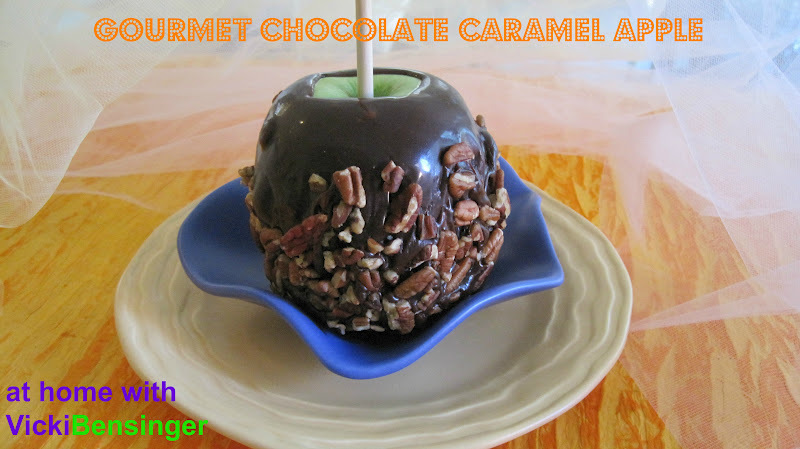 I adore caramel apples…but your chocolate version is nothing short of amazing! I could just eat spoonfuls of that topping…so yummy! Caramel apples are that treat that makes us feel like kids again. Love these! Vicki , the chocolate caramel itself looks delectable ! ;D But it looks really pretty and delicious coating that tangy green apple ! Love it ! I really like caramel apples but only in the autumn and since it’s spring here now, I’m only in the mood for salads. I’m going to bookmark this under “check in autumn”. 🙂 They look great. my favorite all time Halloween treat, I always buy Mrs’ Pringles… on QVC. now I can try and make my own… I never have time but you have diffinitely inspired me.. mouth is watering at 6:30 am … amazing! Oh my gosh this is fabulous. You took caramel apples to a whole different level here. Very Very yummy and Absolutely beautiful I really like caramel apples. Fantastic work on making Gourmet Chocolate with natural way. Its good for health. amazing work. No need to buy one from the shops when you can make a perfectly gorgeous one like yours! Thanks for the recipe Vicki!